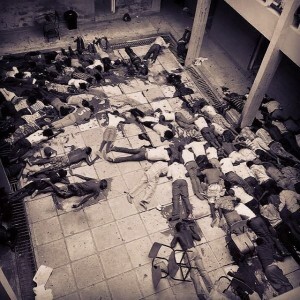 I’m not just talking about the barbarity of African Muslims killing 147 Christian students in Kenya last week. I’m talking about the escapist, incomplete, pacifist bilge you hear from some believers in its wake. If you are the sort of person who considers what happened here — armed zealots, mentally and spiritually crippled by Mohammed, systematically slaughtering anyone who identified themselves as a Christian — and you respond by thinking out loud “well, what can a Christian really do about this; didn’t Jesus only pray for his enemies?” then, please, take ten steps back. Get away. You are a danger to the body of Christ. That is the sort of theology that gets people raped, robbed, beaten, and killed. If you are in a church that teaches the half-strength Jesus, get out. Don’t walk. Run. Now before you play the “warmonger” card, let me make it clear. Of course, we pray for our enemies. Congratulations. You have read the Sermon on the Mount. Now read the rest of the Bible, and understand that the Sermon on the Mount is not a government tactical response guide. If it were, you would have had your hand cut off and your eyes gouged out by now. The Sermon on the Mount is a hyperbolic commentary on the vast gulf between man and the Kingdom of Heaven; it is not a personal or a corporate policy manual. If you think it is, please let me know how many of the men in your congregation have received church discipline for pondering Hayley Atwell a touch too long. Settle matters quickly with your adversary who is taking you to court. Do it while you are still together on the way, or your adversary may hand you over to the judge, and the judge may hand you over to the officer, and you may be thrown into prison. Get it? Jesus knows there’s an earthly judge, an earthly prison, even an earthly gallows where you just might wind up if you somehow can’t quite explain why you shot someone in the head for believing in Christ. Jesus, in other words, is talking to reasonably civilized people here– seekers who are dickering over a 3 shekel difference on the wine bill at that wedding up in Cana. He’s not talking to orange-bearded Afghani village elders getting ready for the next boy auction. He’s talking to the adopted children of God, not the craven and unapologetic children of the devil. In the New Testament, Jesus affirms the role of the magistrate, by calling him diakonos — “a minister of God.” The magistrate is meant to put fear in evildoers and he is given the sword, or its modern equivalent, to get the job done. Christians, we don’t have time for the half-strength Jesus. He is the King, now and forever more. He is seated at the right hand of the father and “all authority in heaven AND ON EARTH” is given unto him. If you don’t believe that, if you don’t believe He wants these Islamic thugs brought to justice, you should check your soul tank. Did you say Class A?